Four Champlain Valley Union High School teams were rewarded for excellent regular seasons this spring with top seeds heading into postseason play. With an undefeated season, the CVU girls tennis team got the No. 1 seed and earned an automatic bye into the Division I quarterfinals, a good start as the team chases another state title. The Redhawk boys and girls lacrosse teams also earned top seeds and byes into the quarterfinals. The boys finished the regular season at 14-1 and the girls wrapped up the best regular season in program history with a 14-2 record. And then there is the Redhawk baseball team, which dropped only one game this season and also earned a No. 1 seed heading into the playoffs. One thing is for sure, the Champlain Valley fans are going to very busy this postseason. The Champlain Valley girls tennis team have won three straight state titles and have finished those seasons undefeated. The Redhawks will try to make it four in a row when they kick off the postseason with a bye into the quarterfinals. The 13-0 Redhawks will take on the winner of No. 8 Mount Anthony (5-3) and No. 9 Colchester (7-8). The quarterfinal match will take place on Thursday at 3 p.m.
Stephanie Joseph, fresh off her individual singles title, will lead the team at the No. 1 singles spot, while Sophie Dauerman, Renee Dauerman, Kendall Blanck and Corina Gorman will likely take the other singles spots. Maddie Huber and Jalen Murphy have recently seen time as a doubles pairing, while Riley Boucher and Julia Blanck have formed the other doubles group. The CVU boys tennis team wrapped up the season with an 8-6 record and the No. 9 seed in the D-I playoffs. The Redhawks traveled to No. 8 Brattleboro on Tuesday to open postseason play. Leading the way in singles are Ivan Llonda and Josh Ashooh, who both had strong individual tournaments. Joe Warren and Brandon Bartlett will likely also take to the court in singles matches. CVU’s doubles teams have been mixed and matched all regular season, with Ethan Lisle and Nathaniel Walker teaming up for a win in the final match, while Jonathan Walker and Peter Hyams made up the other doubles tandem. If the Redhawks take down Brattleboro, they will advance to face the winner of No. 1 Stowe and No. 16 Burr and Burton. The Champlain Valley girls lacrosse team just wrapped up the best regular season in the program’s history, finishing with a 14-2 record and the No. 1 seed in the D-I tournament. The 14-2 Redhawks earned a bye into the quarterfinals on Saturday at 11 a.m., when they will face the winner of No. 8 BFA-St. Albans (6-7) and No. 9 Mount Mansfield (6-8). Paced by Lydia Maitland and Bella Rieley, the CVU offense has scored 10 or more goals in all but one of its games. The only setback was an 18-7 loss to Hanover, N.H. The defense, paced by goalie Ali Wainer, has allowed more than 10 goals in just six games. 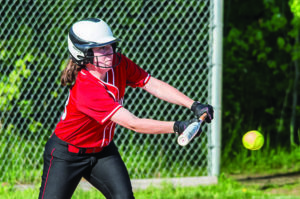 Two wins to end the regular season were enough to help the Champlain Valley softball team advance to the postseason as the No. 12 seed. The Redhawks were scheduled to take on No. 5 Colchester (13-3) on Tuesday in the playoff opener. CVU lost to the Lakers in their only meeting of the season 23-2. Riley Canty has taken the ball as the team’s starting pitcher in every game this season. The Redhawks offense can produce — it has scored more than 10 runs seven time sthis season, but it has also been inconsistent. and will likely do so again to start the postseason. Jake Schaefer scores a goal during CVU’s hard fought game vs. Middlebury in Hinesburg on Friday. CVU won the overtime contest 7-6. 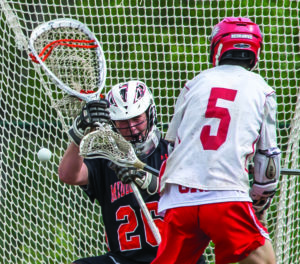 The Champlain Valley boys lacrosse team’s push for a sixth straight title starts at 4 p.m. Friday with a quarterfinal game against the winner of No. 8 Middlebury (7-8) and No. 9 Mount Mansfield (6-9). The Redhawks have scored more than 10 goals in nine of their games, with the offense powered by Jake Schaefer, Walter Braun, Will Braun and James Bernicke. CVU rolled through the first part of the season, winning 13 in a row. The team hit a small snag in the final four games of the season, winning three of the games by just a goal and recording its first loss of the season to Essex, 8-7. The CVU baseball team (15-1) is solid in every aspect of the game this season. With Liam Reiner, Kyle Rivers and Hank Caswell taking the ball to start and Ian Parent providing the bulk of the relief work, CVU will be able to have flexible pitching throughout the postseason. At the plate, the team has gotten hotter as the weather has warmed up and has only been shut out once — in the team’s 1-0 loss to South Burlington. With such strong depth all over the diamond, the Redhawks have their sights set firmly on Centennial Field and the program’s first state title since 2013. CVU opened the postseason Tuesday vs. No. 16 Mount Anthony.